Scanning through the archives whilst the servers backed-up I noticed this image from a test shoot with model Abi, shot late last year. It must have not grabbed me at the time but looking at it a second time I think it's a beautiful photograph, thought I'd share it here. It's interesting how my taste in images changes year on year. Often an annoyance with photography, it's subjectiveness. A couple of recent portraits I've taken which in terms of look and feel share a few similarities. Firstly actor and very funny man Stephen Mangan (above) who was a total dude and had everyone in stitches. Mr Terry Pratchett, who broke the ice by joking with me that my flies were undone (they weren't, I quickly checked). This portrait of Terry is fast becoming one of my favourite pictures I've ever taken. Both portraits shot with very similar set-ups, 50mm, strong key - left and high, big close fil and sharp light fall off. This poor chap was becoming increasingly incensed trying to sort out his broadband problems with Virgin Media - I can sympathise. 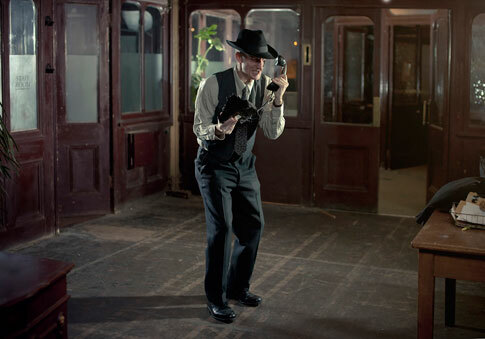 Or he's an actor I photographed at the Farmiloe building in London for the very fun Secret Cinema. This is Charlie Dennis, an amazing looking chap. I shot a few portraits of him earlier this week, this is my favourite and there are a few more after the jump. A portrait of the beautiful Molly.